I really wanted this race recap to be about beating one or both of the goals I set for this race. I wanted it to be a positive, happy-go-lucky recap like most of my race experiences are. 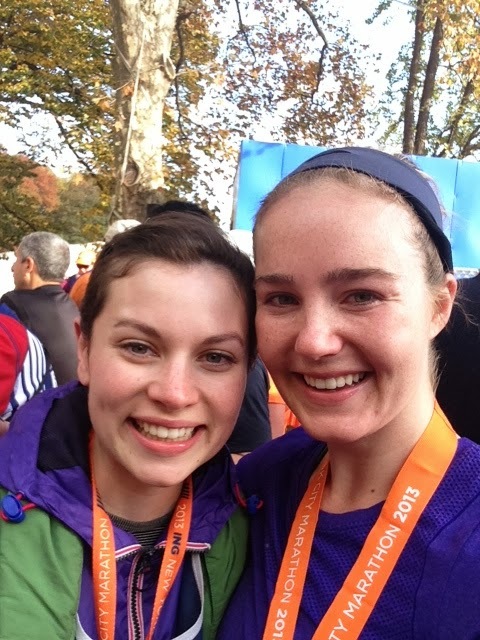 But Sunday's marathon was one of the hardest things I've ever done. There were times when I wasn't sure whether I would be able to keep going. But I did, and I crossed that finish line. And for that, I'm really proud of myself. The days leading up to the race were filled with the normal mix of excitement and borderline anxiety/nausea. I went to the expo on Thursday night ready to spend some cash on a new running jacket. After 6 try-ons and sending photos to both Keith and my sister Kelly, I finally decided on the purple one. I wanted the white one solely because I thought Olivia Pope would approve. I spent the weekend carbing up, and thinking about the race. I laid out all of my clothes, painted my nails, hydrated properly, and got to sleep nice and early the night before. 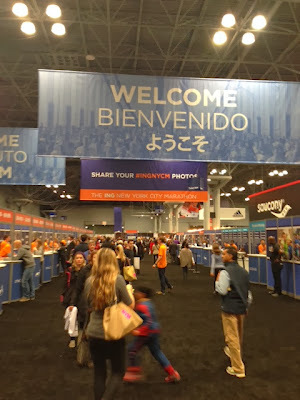 On marathon morning, I woke up 20 minutes before my alarm, ready to jump out of bed. I took a cab to the ferry terminal, and got there with plenty of time before my ferry. Things seemed to be a little bit behind schedule when I got on the ferry, which took off a few minutes late (making me even more nervous). Then the buses had massive lines to get to the start. By the time I got to the start village, I only had about 15 minutes before I needed to get to my wave (I still somehow managed to hit the porta potties about 10 times). While waiting in my wave, I tried to block out the noise and focus on the race. I felt good, I felt really ready to run. The moments after the gun went off, and we started running on the Verrazano Bridge, it felt surreal to finally be running this marathon. It was quiet and windy, and I barely felt the elevation under my feet. My game plan was to run the first few miles at a slower pace, then pick it up to close to marathon pace (9:10 mile). I started out at about a 10:00 pace, and was right on plan by mile 3. Running through Brooklyn was amazing. The crowds were so diverse and happy to be there. From the boisterous crowds in Bay Ridge to the hipsters holding kale and bananas in Park Slope, their energy made the first few miles fly by. I tried to run on feel, but monitored my pace that hovered around 9:10/9:15. I followed behind people that were going about my pace (a pair of Italian guys chatting away, another Kate who must have had her name ironed on the front of her shirt. I kept turning my head every time someone said our name). I was so, so happy. 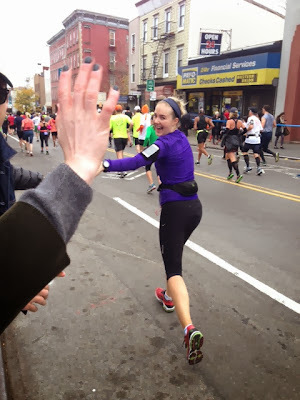 Then I turned onto a familiar street in Brooklyn at mile 11, and I felt a little pain in my left IT band. I slowed down a moment, and then the pain came back so intensely I said "OUCH!" out loud. I knew, deep down, that this was not good. I decided to slow down my pace, and really walk through the water stops that I had been swiftly jogging through before. I told myself not to allow the pain to affect me, but it kept rising. I knew I was going to see Keith and some friends around mile 13, so I decided to keep going and hoped that seeing them would make the pain go away. As I approached mile 13, I was starting to feel pain in my right leg as well. But I was determined to have a smile on my face when I saw my friends. I made the turn onto Greenpoint Ave, the most familiar part of the race for me, and got a real jolt of energy from seeing Keith! I gave him a quick kiss, threw some high fives, and I was on my way. I popped the two tylenol I had in my running pack at the next water station, which helped a little bit over the next mile. Last year, the tylenol I took at mile 18 combined with seeing my family helped push me to run the last 6 miles at a good pace. I was hoping I would have the same luck this year, and that the pain would magically disappear. As I approached the base of the Queensboro Bridge, the pain crept back. I made it my mission not to walk, since I had run the bridge so many times during training. I slowly passed other runners, just telling myself to give everything I had. The downhill on the bridge was killer on my legs, and once we got to first avenue, the roaring sound of the crowds couldn't dissipate the pain I was feeling. I decided to put my iPod on to get my mind off of it. I knew my family was waiting about 20 blocks up, so I tried to focus on looking at the crowd for them. 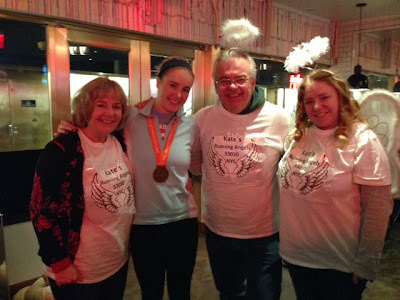 I saw my amazing running angels at 93rd street, and when they began to cheer for me, the entire half block around them started cheering for me too. Kelly remembered a story I told her about the Cape Cod Marathon, when I had running angels who helped me get through the race. And this time, it was my family who were my angels. I was in so much pain at this point, that when I saw them I just started to cry. Kelly had more Tylenol ready for me, and they told me how great I was doing. After I left them, the worst part of the race came. I was still about 7 miles from finishing, and the pain was almost unbearable. I told myself to walk through the water stations and just keep going. I had my music on, but I couldn't even tell you what songs played. It was a real low point not only because of the pain, but also because I was so angry that I wasn't enjoying this race I had worked almost 2 years towards. I have talked and thought and dreamed about this race so much, and I couldn't even keep my head up and smile during it. I was wishing so hard I could go back to the start line and just start slower. I would have given anything to go back 3 hours and remind myself that it was a windy day on a really hard marathon course. It wasn't the day to set a PR. But at the same time, I didn't think I really started out that fast. It didn't feel fast, and yet I still was having this intense pain in a part of my body that literally didn't give me any issues during training. I was angry that I wasn't enjoying the race, and angry that I couldn't think any positive thoughts. Once we went through the Bronx and came back to Manhattan, I counted down the blocks until I would see my family again. When I saw them at about mile 23.5, I started crying (again), and told them how much pain I was in. They encouraged me to keep going, and later told me that I actually looked good compared to a lot of people at this point. I was still running. When I turned into the park, a moment that I thought would be inspiring, I just rejoiced in the fact that I only had a little over two miles to go. I looked down at my watch for the first time in about an hour, and realized I would finish slower than my time at Philadelphia. I put all my strength toward looking at the crowd, because I knew that Keith said he would try to see me again near the finish. I pulled out my headphones when I had about a mile to go, and caught a glimpse of Keith and the crew on 59th street. I heard Keith yell at me to finish strong, which I wanted to do so much. I tried to pick up the pace, but my legs didn't want me to. At this point, I was proud of myself that I was still running instead of walking. The last few meters flew by, and I smiled up at the camera when I crossed the finish. I thanked the high heavens it was over. As I was moving towards the crowd of runners getting their medals, I saw my amazing friend Meggie who was volunteering. I couldn't keep my emotions in any longer! I started bawling, and gave her a hug. I was so happy to see someone I love, and be able to unleash some of the negativity that I held onto during the race. I made my way to lunch with my family and friends, and started crying more when I saw them all. I was so disappointed in the race, and I didn't understand why it happened. But once I got some of it off my chest, I was really thankful to have people I love around me, and beers and burgers on the table. Are you still with me? I know that was uplifting. I don't mean to be dramatic, but I have had a hard time coming to terms with this race. During the race itself, I kept asking myself why I was in so much pain after so many months of hard training. Should I have run 5 days a week instead of 4? Should I have done more speed work? Am I simply not as fast as I think I am? I've had a few days to ruminate (and mope) about what went wrong, and I still don't have any answers. The simple answer is that I probably did go out too fast, and compared to other people perhaps I didn't train as much. I feel better after talking to a few of my friends who said they also lost steam, and thought it was a really hard race. But then I also look at the race times of other people who did awesome, and I am selfishly jealous of them. Why them and not me? The hardest part for me was not being able to enjoy the race. At the end of the day, it's just a number, and finishing is the hardest part. I am angry that I wasn't able to enjoy the race I have been looking forward to for so long, and trained so hard for. I just wanted it to be over. As a sentimentalist, I'm sad I won't look back at this race as a happy day. But maybe with some time, I'll have more perspective. I'm hoping I will look back at this as a day I persevered. Even though I didn't break any records, I'm happy with the time I completed the race in despite the pain. What I do know is, I'm going to take some time off from running. I don't know that I want to sign up for another marathon in the near future. I certainly lost some confidence in this race, and I need time to build that back up. I do feel pretty sure I will do another marathon, and the goal for that race will definitely, 100% be for enjoyment. My mom said something to me yesterday that I really appreciated. She told me that the marathon isn't the accomplishment. The training is. All of the early mornings and long runs are what I should be most proud of. And I am. I wish this post wasn't full of so much negativity, but this experience was totally new to me. 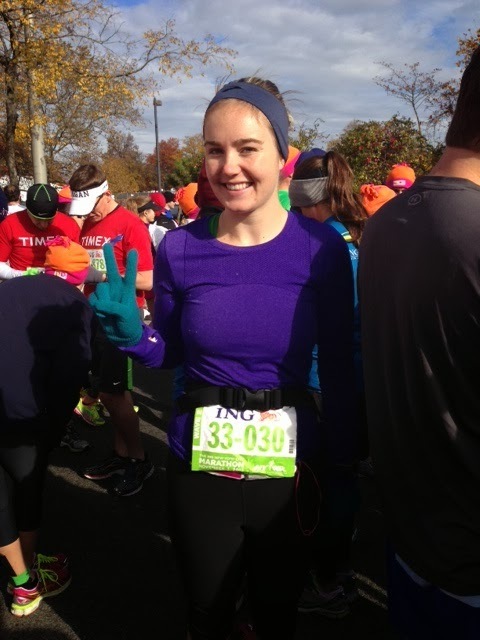 All of my races have been uplifting experiences, which is why I continue to run. I enjoy the sense of accomplishment I get from training and ultimately reaching a goal. And when that doesn't happen for such a big race, I can't help but feel let down. To finish on a high note, here are some things I'm thankful for from this race. I'm thankful that I have more inner strength than I did 3 days ago. I'm thankful I have friends and family who gave me words of encouragement when I felt down. I'm thankful they still love me even though I was a super hot mess right after the race. I'm thankful I have a sweet new NYC marathon poncho that I have little use for. I'm thankful I have another medal to hang on my wall. I'm thankful for the little boy who said "congratulations" to me after the race when I was on the verge of tears. And lastly, I'm thankful I didn't give up. You are stronger than you think - you persevered, through pain and ran THE NEW YORK "KATING WORD" CITY MARATHON! That is an amazing accomplishment and you should be proud. I know I am proud of you.